A military leave of absence is governed by the Uniformed Services Employment and Reemployment Rights Act (USERRA) which protects the employment rights of individuals who leave their job to serve in the military. 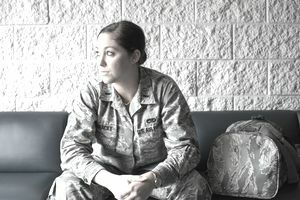 To qualify, the absence must be a result of service in the uniformed services, which includes the Army, Navy, Air Force, Marine Corps, Coast Guard and the Reserves; Army National Guard; Air National Guard; commissioned corps of the Public Health Service; and any other category designated by the President during a war or national emergency. According to USERRA, the cumulative time you can be absent from work for military duty and retain reemployment rights is five years. An employee should provide the company with notice of the need for leave as far in advance as possible unless military necessity prevents doing so. Written notice is preferred, but it's not required by law. Employees should get a Request for Leave of Absence Form from Human Resources to request a military leave. HR will review and sign the Request for Leave of Absence Form and process any other relevant documents. When the employee plans to return to work, he should apply for reemployment with HR as per below. Here is a sample letter advising an employer about taking a leave from work for military service. Download the absence letter template (compatible with Google Docs and Word Online) or see below for more examples. As per our conversations, I am writing to formally notify you that I will perform active duty with the United States Navy beginning on September 1. I have enjoyed my association with ABC company and fully expect to return to my job once my military obligation is met. As you know, my absence from work for this period of military service is protected by the Uniformed Services Employment and Reemployment Rights Act (USERRA), 38 United States Code, Sections 4301-33. I am hopeful that my leave will not negatively impact the organization and I would be glad to train and orient my replacement prior to my departure. My last day at work before I begin military service will be August 1. I do not wish to take paid leave during my absence, and I do not want to maintain health insurance coverage during my absence. I can be reached at the above address and phone number while I am on active duty. If you have any questions about the provisions of the Uniformed Services Employment and Reemployment Rights Act (USERRA), you can contact the United States Department of Labor at 1-866-4-USA-DOL (1-866-487-2365). Best wishes for continued success at company ABC and I look forward to the day when I can return to my job. If you would prefer to email your excuse, here's how to send your email message. If the absence is for a period of 30 days or less, the employee must report to work on the next full, regularly scheduled workday, plus 8 hours. If the absence spans 31 to 180 days, the employee is required to notify the employer of his/her intent to return within two weeks following the end of their military service. If the absence runs 181 days or more, the employee has to inform the employer of his intent to return to work within 90 days after the end of his military service. Employees may need to provide an excuse letter when they miss time from work to interview or for other reasons. Here are more sample excuse letters can be edited to fit your personal circumstances.